Technically anything edible which is obtained from sea or any other water body (even fresh water) is termed as Sea food. There are many things such as Fish, Shellfish, Seaweed, which are edible and are obtained from sea, but here we will be discussing only about Fish and Shellfish. The difference between fish and shellfish is that fish have internal skeleton (endoskeleton) and shellfish have external skeleton (exoskeleton). 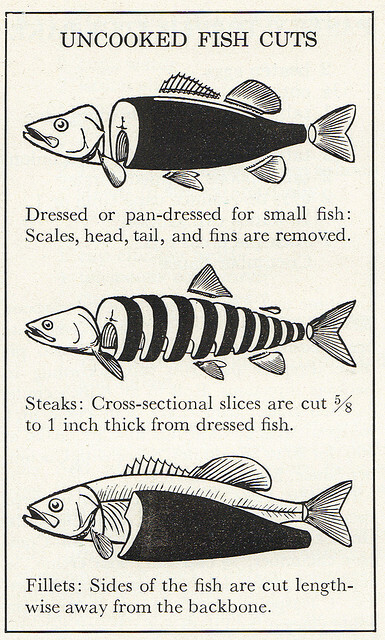 The flesh of fish is similar to any other meat in terms of composition, only difference is in the ratio. Fish has high amount of protein, water and in case of oily fish high fat contents, other than this there are some vitamins and minerals also which is present in fish. When compared to any meat, fish is very tender and is cooked fast even on low heat as it has less connective tissue. The toughness of the meat is result of protein coagulation due to heat, that’s why fish should be handled very carefully after cooking as it tends to fall apart. Unlike Meat there is lots of option in fish but less in cuts, in meat it is the other way round. Fish which has internals bone structure and have fins which helps in swimming also they have gills which is used for breathing in the water, these are further divided into different category on the basis of their oil content, water from which it comes and shape of the fish. There is two more segment i.e. Anadromus and Catadromus. Fish which come from salty water bodies are termed as sea water fish or salty water fish. These account for majority of fish which is included in fish cookery. These fish are more salty in flavor as the flesh contain more salt when compared with fresh water fish. They are round in shape, have eyes on both the side of the head. Depending upon the fish the flesh can be either lean or have fat content. These fish are flavorful as most of them are oily and have oily flesh, the flesh is delicate and white. Example of this fish are Arctic Char, Black Sea Bass, Blue Fish, Chilean Sea Bass, Cod, Escolar, Grouper, Haddock, Herring, Jack, John Dory, Mackerel, Monkfish, Ocean Perch, Red Mullet, Salmon, Red Snapper, Sardines, Shark, Swordfish, Tuna, etc. These fish are obtained from fresh water bodies and have less salt in their flesh when compared to salt water fish. This fish are mostly round in shape and have eye on both the side of the head. Also fish in this category are either lean or oily, some examples of Oily fresh water fish are Eel, Trout, White Fish, Cat Fish, etc. Examples of Lean fresh water fish are Cat Fish, Perch, Pike, Tilapia, etc. The flesh of oily fish is flavorful and delicate. Fish that spend some part of their life in Salt water and some part in Fresh water, Fish that lives in ocean or sea (salt water) but migrate to lake or river (fresh water) for laying egg or spawning is termed as anadromous fish. Example Salmon, Shad, Artic, Char, etc. Fish that lives in lake or river but swim to ocean or sea for spawning or laying egg is termed as catadromous. Example Eel. However anadromous and catadromous is categorized under salt water fish or fresh water fish by where they spend their most of the adult lives. These have external skeleton which acts as a protective home for the fish in case of danger, the backbone is also missing in shell fish. The shell fish is classified under Crustaceans and Mollusks, Mollusks are further dived into Univalve or Gastropods, Bivalves, and Cephalopods. Crustaceans are sea animals which have outer shell along with legs and claws. Lobster, Shrimp and Prawnsis the most common of all shellfish. Lobster has a flexible tail, four pairs of legs, and two large claws, shrimp and prawn are same except for the missing claws and the size. Other Crustaceans are CrayFish, Craw Fish, Crab and Langoustes. Only the meat from the tail, claws, and sometimes legs is eaten, in case of crab even the body meat is eaten. The meat is white and chunkier, it has very strong and distinctive flavor. The egg (coral), is also preferred by many which is dark green when raw and red when cooked, in case of lobster even the liver or pancreas (Tomalley) is eaten which is green in color and is found in the thorax or body cavity of the lobster. Mollusks are those sea animals which has soft body which may or may not be protected by an outer shell. Mollusks are further divided into Gastropods or Univalves, Bivalves, and Cephalopods. There are other mollusks also but only this three are important in culinary world. These are the animal which has single protective shell, they are found stuck to a side of a rock usually appearing as a rock, the meat is very chewy and salty in flavor can be used raw also like abalone is used in sushi. Example of gastropods are Abalone, Conch, Limpet, Snail, and Whelk. These are animal which have pair of hinged shell as a protective home, they compressed bodies enclosed in the shell, have no head, and also lack a Radula.The gills have evolved into Ctenidia,specialized organs for feeding and breathing. Most bivalves bury themselves in sediment, where they are relatively safe from predators. Others lie on the sea floor or attach themselves to rocks or other hard surfaces. A few bore into wood, clay or stone and live inside these substances. Some bivalves, such as the scallops, can swim. Example of Univalve is Clam, Oyster, Cockles, Mussels and Scallops. The term cephalopods mean “foot attached to the head”. Though this animal have no outer shell still they are categorized under Mollusks as they don’t have internal skeleton. Example of cephalopods are Octopus and Squid which has tentacles attached directly to their head. Cuttlefish is also a cephalopod. I will give details of buying, preserving, handling and storage of fish and shell fish in my Next Post till then happy reading!! !